A sculpture artist, a creative director and, now, a film producer, Nicole Naone is on fire. As a trained visual artist with an international portfolio (primarily in sculpture), Naone is deeply attached to her creative work. “Art is definitely my first love. 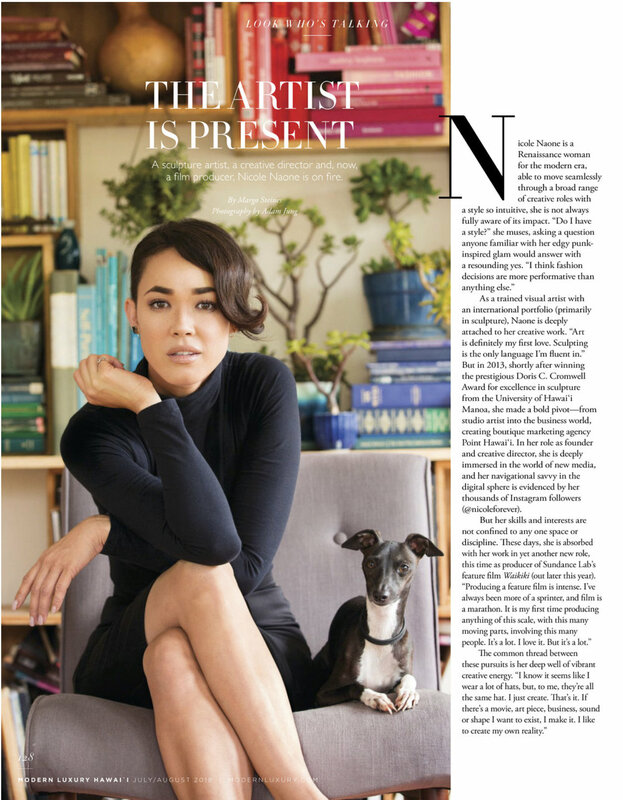 Sculpting is the only language I’m fluent in.” But in 2013, shortly after winning the prestigious Doris C. Cromwell Award for excellence in sculpture from the University of Hawai`i Manoa, she made a bold pivot—from studio artist into the business world, creating boutique marketing agency Point Hawai`i. In her role as founder and creative director, she is deeply immersed in the world of new media, and her navigational savvy in the digital sphere is evidenced by her thousands of Instagram followers (@nicoleforever). But her skills and interests are not confined to any one space or discipline. These days, she is absorbed with her work in yet another new role, this time as producer of Sundance Lab’s feature film Waikiki (out later this year).